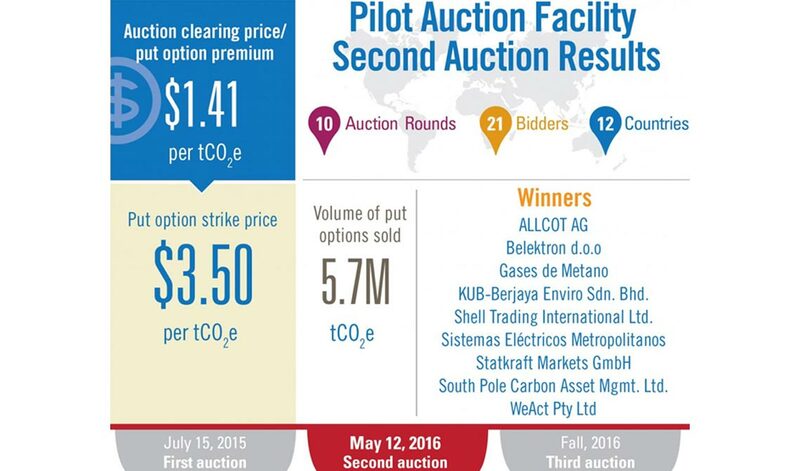 WeAct was twice a winner of the World Bank’s Pilot Auction Facility (PAF). The PAF is an innovative carbon finance solution developed to stimulate investment in projects that reduce greenhouse gas emissions. The PAF uses competitive auctions to allocate scarce public funds and leverage private sector investment into CDM projects. The PAF incentivises private sector investment into these projects by providing a guaranteed floor price on a project’s CERs through the auctioning of put options. In 2016, WeAct was successful in the second PAF auction and purchased put options on CERs from methane reduction projects. In 2017, WeAct successfully participated in the third PAF auction, purchasing put options on nitric acid CERs. The put options purchased from the World Bank’s PAF give WeAct the right, but not the obligation, to sell CERs generated from eligible CDM projects to the PAF at the pre-agreed strike price. In the case of the second PAF auction, WeAct paid the option premium of USD $1.41 per tonne for the right to sell methane reduction CERs to the PAF at the strike price of $3.50 per tonne. This optionality allows WeAct to benefit if the market price for these CERs rises above the strike price of $3.50 per tonne. On the flip side, if the market price falls below $3.50 per tonne, then WeAct can sell the methane reduction CERs to the PAF at the strike price. In this way, the PAF put options provide a guaranteed floor price for the CERs. The floor price provided by the PAF’s put options has allowed WeAct to more confidently invest in methane and nitrous oxide reducing CDM projects. In addition to exercising the put options, the PAF program has also created a mini-market for methane and nitric acid CERs. WeAct has sold PAF eligible CERs to put option holders who purchased to cover their open positions. WeAct has also traded put options with other PAF market participants. The PAF is an innovative carbon finance solution that has successfully utilised public funds to leverage private sector investment. Its model of auctioning put options to market participants has widespread application as a number of state and federal governments seek to establish carbon funds.